In my previous blog post, I wrote of presenting to an Aviation-based convention, APEX, held in Seattle the second week of September, 2011. This was an important time for aviation and travel, given it coincided with 10th anniverary of the events of 9/11, and their aftermath, which continue to impact on travel. This is especially so in the USA, where commercial aviation remains vigilant about repeat events, while trying to make travelling by airliner as comfortable and pleasant as possible, in the current circumstances. It’s not an easy ask, but technology appears to be coming to the rescue, up to a point, by its introduction to the cabin environment of everyday technologies, such as wifi, iPads and other sources of entertainment to while away the hours. It’s as if a return to the fun days of commercial aviation is possible, before the introduction of budget airlines and tight security. I had such issues in mind when I constructed my presentation on fear of flying for aviation personnel for the APEX conference , which I delivered at the convention, September 12. As my previous blog entry describes, I was the first of three to speak in the late afternoon session, which allowed me to set up my equipment during the coffee break. This included setting my iPhone 4 on a nearby table so as to video record my presentation for later editing. That’s now complete, and the result is on my page on YouTube. Now I get many notes in the evaluations of my Presentation Magic workshops, or indeed any presentation I do using my presentation magic “style”asking how and why I did what I did. So, I decided I would do a Director’s Cut version of my APEX presentation here on this blog. Those in the aviation industry who watch the video will likely not be interested in the same things as presenters wishing to learn more of my presentation concepts, so it’s here in this blog where I’ll ask you to follow along. 1. Just watch the video through from beginning to end (it’s roughly 38 mins) and let it wash over you as if you are a member of the intended audience. 2. Or, you can open it in a separate window and keep this page open as I take you through each element on a timed basis, using the time elapsed in the YouTube video as the key. 3. Or you could do 1, then 2, and see the video twice. Hence, the reason for calling it the Director’s Cut, as is done with DVDs with its extra tracks. One of the missing elements in the current edition of Keynote 09 is a timeline, an easy way to edit resultant videos so as to play as a standalone video or on a service like YouTube. When it exports it as a video, Keynote either allows the viewer to manually advance each element of the video, or it allows for a fixed timing for each build and slide. This has its uses but not with the video I wish to show you. For this, I had to step away from Keynote and use an editing software. I could have used iMovie or Final Cut, but instead I chose software which I find more intuitive and that’s ScreenFlow 3 from Telestream, the same people who provide Flip4Mac to allow viewing of .wmv movies on Macs seamlessly. Intended initially to help software developers make videos of to show users how to best employ their apps by showing the workflow on the screen, I find it has applications to help make up for Keynote’s shortcomings. To record my presentation, I simply placed the iPhone on its edge, having made sure the camera captured the physical area in which I would be presenting. I switched it on as the session started, then moved into frame for the introductions. At the conclusion of my presentation, I synched the iPhone with my Macbook Pro, at which time the 3GB or so video was imported into iPhoto. From there it could be dragged into the ScreenFlow 3 timeline, where the audio and video tracks were separated. I needed to do this because my Keynote file also contained movies with sound which needed to be mixed with the live sound so as to capture the audience reaction to what I was showing. My intention was to cut back and forth between the live presentation featuring me centre stage with the projected images behind me (see below), and the movie of my Keynote file, once it was exported in Quicktime format. All things considered, the Quicktime output does a good job of preserving the embedded video files and maintains the sharpness of the fonts, pictures and build styles and transitions, as long as you don’t overuse compression protocols. I actually allowed the Quicktime movie to be in DV-PAL format despite the resultant size, which was then imported into ScreenFlow 3. The resultant file was more than 4GB. I could have extracted the audio and video from this Quicktime file, which woud have left two audio and and two video files. This is not the sort of production I do everyday and I wanted it up on YouTube quickly, so I left the Keynote video intact, with both audio and video. In future efforts, I may change the workflow and separate the tracks, but the issue of keeping all the material synchronised is a serious challenge. The decision one needs to make in producing this kind of video is when to cut away from the live presentation to the Keynote presentation and when to cut back. It needs to be done smoothly with consideration given to any transition styles, just as one would with Keynote or Powerpoint. Up to a point, the decision is made for you. At the beginning, you have your opening slide where you’re being introduced, then cut to you making your opening statements with the same opening slide behind you, then cut to the slideshow again once the first slide makes its appearance. It’s actually not quite as easy as it sounds as I wanted to use some of ScreenFlow’s built in transitions to make the appearance a little easier on the eye, rather than just cut back and forth. This means careful timing so as not to cause a disjuncture or rupture of the sequence, nor loss of information on the Keynote builds I used. Let’s just say that it required quite a few “undo-redo” commands before I was happy with the outcome. This wasn’t easy, since the more small Quicktime movie files built up (rather than two long videos), the more ScreenFlow began to act flakily, crashing frequently, something I am still working with its helpdesk team to resolve. In essence I had scores of small Quicktime movies from both the Keynote video and the iPhone video littering the timeline, and it’s likely these choked ScreenFlow. Trouble was, rather than falling over early in the export of what I thought was the finished product, it fell over right at the end, often after a half hour of processing, only to have me start again. Very frustrating. In the end, I firstly exported the Screenflow audio track only, then the video only using Voila’s Screencasting ability. The irony here is I had to use a screenmovie (Voila) of a screenmovie (ScreenFlow 3) to achieve the final product! I then used Quicktime Pro to bring video and audio together in synchrony. So, let’s go to the YouTube video now, and I’ll walk you through a timeline of what, how and why I did what I did, including errors which I would correct if I gave the presentation again. This way we all learn. 00.00: This is the slide I created by using the brand slide I was asked to use throughout my presentation by APEX management. I used it only once, because it made no sense to use it elsewhere. I saw some other presenters staying with it, but then others merely used their own presentation stacks which they had clearly used for other conferences or sales meetings. 00:27 I use one of ScreenFlow’s transitions to open the live video coverage. I had positioned my iPhone so as to capture a fairly wide shot yet with me in the centre, with the screen behind my left shoulder. I actually placed some marks on the floor so as to remember where I ought to stand most of the time, especially when I played videos and needed to be out of shot temporarily. If you look at the first time I’m shown, you’ll see my Macbook Pro on the ground infront of me (it has an Incipio black cover so as to not draw attention to the Apple logo. If people think I’m using Powerpoint to achieve my effects because it looks like I’m using a Lenovo or Dell laptop, all the better!). Also, you’ll notice my iPad sitting in landscape mode in an iKlip holder attached to a music stand. This is my vanity monitor setup, with Doceri software allowing me to see what’s on the screen behind me, and to go into presentation mode at the tap of a button on the iPad screen. In my right hand, is my Kensington remote for controlling the Keynote show. 00:46 At this point, having read the bio I had supplied her, the session moderator asks this aviation audience if anyone has a fear of flying. To her and my surprise, quite a few hands go up, and I’m already thinking ahead about my content and if it will need any alterations on the fly given the audience composition. I thank the host, and launch into one of three different introductions I had rehearsed, depending on the size and composition of the audience, as well as the tone set by the moderator. I rehearsed these out aloud in my hotel room to hear what sounds good, and to make sure the words come out clearly, given the audience might be surprised at my Australian accent. This is especially the case as the audience was a very mixed one culturally, a point I’ll come back to later on when I discuss a potential faux pas I made. Notice how the brightness of the screen behind me washes out much of the slide due to the iPhone 4’s mediocre camera quality, hopefully improved in the iPhone4s, just released. This is why it was necessary to edit in the actual slides from Keynote. 01:12 An unrehearsed element here, where I acknowledge the number in the audience who have identified as having a fear of flying. It’s possible I might call on them later in the session to discuss some of my ideas in a workshop style, but frankly time is so tight (I have 30 minutes allotted to me) it’s unlikely. 01:17 At this point I launch into my prepared and rehearsed presentation with accompanying slides. Because fear of flying is an almost undiscussable in the aviation community, especially this one which is about the positive passenger experience, I knew I had to make the subject palatable rather than scholarly. An academic presentation would be for a different audience. This audience needed to be convinced it was a worthwhile topic, and that if they understood it, there could be financial gain for them. So I started off by taking a one-down position, making fun of myself for having chosen potentially the wrong profession to be in, by focussing on two times in history when fear of flying was not at all unusual, and thus not requiring the services of a clinical psychologist. As you’ll hear, the first was during the barnstorming days in early aviation when it really wasn’t that safe to fly. This generated a little laughter, as if the audience wasn’t sure if they were meant to laugh at such a serious, academic and potentially dry subject, but as they got into the talk, you can hear how they loosened up, hopefully with me giving them permission to have a chuckle. This is part of the engagement process, keeping your audience expecting more fun or surprises ahead. 01:49 Note how the picture of the wingwalker is framed like an old photo album, using one of Keynote’s border features including album corners. You’ll see the picture dissolve into full colour, because it’s actually a very modern photo. I had tried to find an original photo from the barnstorming days, but failing that I located a modern one, and using an effect from software called FX Photostudio Pro (which came with one of the recent Mac software bundles), I used a supplied filter to give it an aged look. The use of a fullscreen, high-res photo which then dissolves into a full colour image gives the audience an immediate sense that this is not your usual Powerpoint. It keeps me central as the main generator of words and ideas, and informs the audience from the get-go that this will be a highly visual presentation, accompanied by my commentary. I do this in almost all the presentations I give no matter what the subject. Those opening moments are crucial in setting the mood and expectations for what is to follow in the next 30 minutes. 02:07… I single out Ellen Church as the first FA and tell a little of her story. Note please how I do NOT use a laser pointer to locate her on the slide. I dissolve to a second slide – a duplicate of the first – but where the second slide is altered in both sharpness and contrast, leaving a cut out of the subject in high contrast so the eye is drawn there. I also use a shadow effect to outline her with a glow so as to be absolutely sure where your attention goes. I believe it’s important early in a presentation to have these effects to train your audience to expect their attention to be directed by the story you are telling. How I actually created this effect in Keynote is interesting. I used Keynote’s “Mask with shape” feature to create the cutout of the subject from the first slide which was then pasted into the second slide, and the two slides are then dissolved. To the audience it appears as if the subject has materialised from the slide, which is the intended effect, and they are oblivious to the fact two slides were used. This is not easy to achieve in Powerpoint, because its “dissolve” transitions do not come close to Keynote’s underutilised and underestimated “dissolve”. 02:30 I continue to establish the story of FAs and their initial employment to help nervous flyers, thus establishing that fear of flying is as old as flying itself, and thus there is a body of knowledge about the subject. However, I still need to make the connection to current understandings of fear of flying, and why it is still a relevant subject in 2011, despite the vast improvements in aviation safety and comfort. 03:10 The slide has been on the screen for long enough, so it’s time to give the audience more things to please the eye and ear, yet remain true to the story I’m telling. At this point, I introduce the audience to a new ABC TV show which is due to start in two weeks from my presentation (September 25) called, PAN AM, based on the defunct airline during its halcyon days in the 1960s, when commercial aviation was still glamorous and exotic. 03:13… my choice of transition, the droplet, to convey a change in time, much like you see in movie dream sequences, or when directors wish to convey a memory or scene change an actor is experiencing. 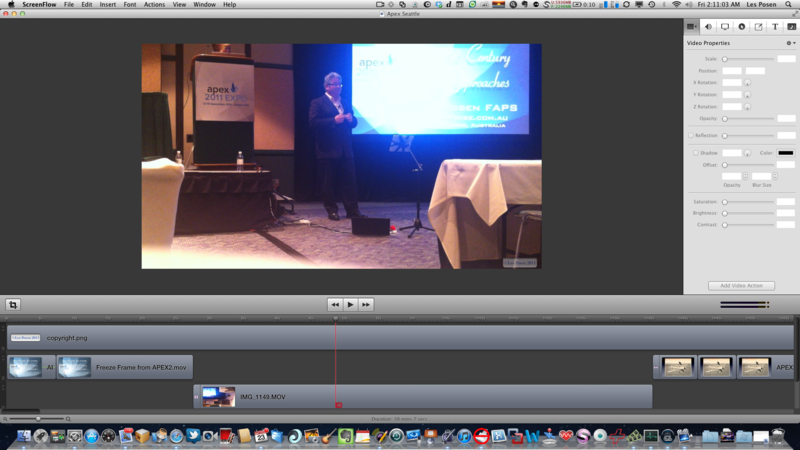 What you see and hear is the video of the exported Quicktime of my Keynote file, with no resolution loss at all. 03:37 The edit here is a bit too sudden, when the actress says, “You’re famous now”, and if I were to re-edit the movie, I would soften the transition. 04:04 I am back centre stage to bring my first point home: the notion of there being a time when it was normal to have a fear of flying, because indeed it was a risky time to fly, and not at all irrational, thus not requiring the services of a clinical psychologist. At this point, I remind the audience I earlier mentioned there being two times when it was normal to be fearful of flying, and now I’m about to introduce the second and more contemporary time, which has direct relevance to the date on which I’m presenting. 04:09 I wanted to talk about the second time being post 9/11, and how companies refused to let their senior staff fly rather than drive to business appointment if they were less than 500 miles away. I needed to find a visual to represent 9/11, and did not want to show the audience of aviation personnel images of crashing planes. For all I know, they may have known victims on board the aircraft involved, and I needed to be respectful of this. The image I used contained elements of patriotism for whom I assumed would be a mainly American audience, as well as showing the WTC towers intact. As it turned out the audience was very mixed in terms of nationalities, and the patriotic image was likely unnecessary. 04:20 I surprise the audience with stories that the fear of flying business suffered after 9/11 because no one thought it strange to not want to fly in the months after. 04:52 Having said the New Yorker cover captures the feelings of New Yorkers, I attempt to justify this assertion by telling of my time in NYC just a few days before 9/11, then tie it in to another aviation event, the collapse of Australian airline, Ansett, to whom I consulted on fear of flying. You’ll thus note that while some of the story elements seem disconnected at first, I try and pull them together with connecting elements, like my own story and memories. 05:22 After telling a personal and unrehearsed story, I return to the main story which is to show at this point that the unnecessary fears over flying post 9/11 had real consequences, and indeed tap into current fears which see people preferring to drive rather than fly despite the available safety statistics. Many people hear these statistics frequently and ignore them, but I chose a particularly interesting study (2009) which shows how driving fatalities increased significantly in the months after 9/11, ostensibly because people drove when they previously would have flown. 05:31 Notice how I display the actual article itself, located from the web, and brought in as a screenshot. I duplicated it twice more, and sent each duplicate behind the other with a shadow outline to convey it was a multipage article and lift it off the screen a little. While the body of the article contains almost unreadable text, the article title is very clear and legible. 05:33 I needed to make my point very quickly and directly, so lifted out the main talking point using a screen shot to create a “call out” using a scaling build in Keynote. Notice how I once more fade the actual article so as to direct attention to the main point. This too was done using two duplicate slides, with the build-in set to appear automatically after the transition. Notice too how the enlarged quote ends on the third line with the word “about”. 3. The auditorium is very big, and those at the back will be challenged to see even large font words. 06:15 I now return with the audience to a current understanding of fear of flying and why those in the aviation industry need to understand it more. I do it by reviewing a seminal 1982 research paper (displayed) produced for the Boeing Corporation, a major presence at APEX whose executives had presented in the morning educational sessions, along with rival Airbus. Once more, I don’t just cite it, but show it, something which required some effort to track down, having long ago lost my original signed copy given to me by one of those mentioned in the article, Dr. Al Forgione of Boston, one of the first to run fear of flying group programs in the USA. 06:37 If my memory serves me correctly, it was Al Forgione who suggested the then CEO of Boeing, Bill Allen (not Paul Allen whom I mistakenly named in the video) wanted to know more about the subject for personal reasons, not just commercial ones. ne slide (which is how Powerpoint users would achieve a similar result) but Magic Move makes it so much easier. 06:55 I draw more attention to the telling part – the memorable part of the slide which sells why knowing about fear of flying is important for this audience – by redlining the numbers in the USA afraid to fly in 1978 when the research was conducted. 07:09 where another screenshot lifts off the page, once more larger and shadowed to give it some depth. This is about as big a scale as I could achieve without the text becoming blurred to the point of distraction. Had it been diffcult to achieve, I would have created the same effect but using Keynote’s fonts to match as close as possible those in the original document, then fuzzed them a little so it appeared they came off the same page. These are the little things that can consume time and effort but which differentiates run of the mill presentations from ones audiences remember. 07:44 More significant points being made, and note that as I say the point the action takes place, in this case an enlarging header. This congruity between what the audience sees and what they hear can help differentiate so-so presenters from professionals, even if I say so myself! By the way, when I attempt this congruity which requires practice saying it and using your remote, I do so in a way the audience cannot see the remote in action. It’s as if my words are causing the call out to take place. Don’t give away your powers of verbal persuasion by thrusting the remote at the computer as if it’s doing the slide transition – this will disempower you in front of the audience. This co-ordination is hard to do – just witness any Apple keynote and watch how the Senior VPs handle it. But practice will help you achieve a truly professional appearance. 08:00 Again, notice the congruity between what I say and the appearance of this extraordinary number, thus accentuating its importance. Subtle but effective. Notice too that I give the numbers a little shadow effect to lift them off the screen, as if to bring it closer to the audience, and give it more salience. 08:07 When I cut back to the live video, you can see just how effective the number is on the screen behind me, so you can guess the impact it would have had on the live audience when it appeared. Given the ubiquity of Powerpoint in aviation (actually Microsoft products in general) this would have been the first time many in the audience would have seen the anvil effect, unless they watch lots of Apple keynotes! 08:12 Notice in this little section here how I use my arms to further convey changes, up and down. Standing behind a lectern, it would look pretty silly doing this but out in the open space on the same level as the audience allows more dramatic and congruent gestures. 08:52 I now wish to draw more attention to the 1982 study’s conclusion which I believe to be of relevance to the group, and so display three essential points. I could have done these in summary format using bullet points, but that would be very ordinary. Instead, I use cut outs from the actual document and speak directly to the points. 09:17 Notice how I use Doceri on the iPad to display to myself the item which appears on the screen behind me. This allows me to face the audience rather than turning my back on them to read from the large screen. 10:14 I start reading accurately then get my message mixed up here. This third element is about loyalty and how one successful flyer can influence others to fly with the same airline, and I end up reversing this to speak about not flying. I’m not sure how I came to do this, and it could be something of a “disconnect” but no one puts their hand up to point out the discrepancy between what I’m saying and what the text actually says. I made the same point in the previous callout, so I’m guessing I wanted to elaborate the point in another fashion. 10:45 Another important article reference, this time highlighted by a redbox appearing around the “money quote” which I read. 11:19 After exhorting this aviation audience to see themselves as part of a therapeutic community helping anxious flyers make a better go of it, I then turn my attention and that of the audience to how the aviation industry in recent times has been researching fear of flying. There are many transitions I could have used, but I often use this one to introduce a new concept or a shift of ideas. Both the old and the new ideas appear together momentarily with the old giving way to the new. 11:23 This next sequence, using a world map to display three recent conferences, is overkill perhaps, but once more it’s an engaging way of demonstrating concepts of time and location, and was created using iMovie 11 which allows you to plug in locations and it will animate a line joining them. The animation is exported as a Quicktime movie then text added in Keynote. In fact there are two movies here, joined seamlessly in Keynote, with added graphics for good measure. I wanted the audience to see one of the roof bodies of commercial aviation, ICAO – an entity of the United Nations – had sponsored the most recent 2007 convention, in an effort to add gravitas. 12:00 A motion dissolve transition moves the audience from a globe to a book which was the conference proceedings of the 2000 convention. Once more, this started out as a flat image from Amazon.com, which Boxshot3D then enabled me to create a 3D book effect. I used some of the cover to create screenshots of the binder edge titles. If I attend Macworld in 2012, I’ll show how to do this great image creation, which I believe makes for a more engaging slide than merely a text-based slide. 12:10 I needed to draw out three important points from the book, so used MagicMove to draw the book out to the left, leaving room to make the points in fairly large text. Notice how I bring the points in one at a time, and no more than three on the one slide. This is very important. 12:46 I show a new Boeing 747-8 in preparation for dividing it into thirds to discuss some important statistics about fear of flying. It’s perhaps a little too early to show the plane as I firstly discuss psychotherapy in general, but it’s not a huge error. I’d do it a little differently the next time. 13:03 Now I apply the rule of thirds I’ve mentioned about therapy in general to airline travel, and so shade the aircraft image using Keynote’s image adjust panel. 13:15 I look to the audience and using my hand to mirror agreement, ask who belongs in the category of loving flying no matter what. It’s just another more active example of being with the audience and keeping them engaged. 13:19 More shading effects to draw out my next point. 14:13 We’re getting – at half way through my allotted time – to the issues many in the audience really want to hear about: What’s fear of flying about? So I divide the concept into two areas, external – what the plane brings to passengers, and internal, what passengers bring to the flying experience. There are numerous causations, which I have mentioned by referring in a previous slide to the heterogeneous nature of this fear (no one size fits all) and now it’s time to become more specific. I could use images for the next section, but instead decided with the time available to use text instead. 14:31 Notice how when I bring in the text, I use a different colour than the header so as to make clear which is header and which is an element. Once more, no need to use bullet points to clutter the slide. 15:11 I’m bringing in subsections of subsections now, but notice that because of my timing of text and sound and my use of indentation, there is once more no need to use bullets or hyphens to clutter the slide. I like my slides clean and crisp. It takes some practice with your remote to time the builds to match your voice. Notice how I keep the remote action as invisible as possible for the audience, and I add to this by using both hands to make my points. 17:23 C level refers to “Chief” as in CEO, COO, CIO, CFO etc. 17:53.. when once more I use MagicMove and a still shot on a second slide to focus on this panel, which looks like a curtain. 18:03 We now see the screen more closely,and I use this to speak of the older, psychodynamic concept of projection, which is a classical Freudian defense against unwanted anxiety. It’s not very behavioural, which is how I tend to think of fear of flying, but it has its place in treatment of certain presentations of anxiety, as you’re about to hear. 18:10 I use a slow dissolve to bring in a set of blue curtains which is a third party Quicktime movie which I have sized to match the curtains on the plane. Notice that the blue curtains appear behind the now rather unfocussed flower jars. It’s subtle and not meant to be noticed, but this took quite some time to do as I had to create another “Mask with Shape” cut out to have the blue curtains appear behind the flowers. 18:20 I offer an everyday example of projection using an unhappy computer experience, and because we’re in Seattle, I point to Redmond, the location of Microsoft, to blame when PCs go bad; a little nerd in-joke. 18:42 The mystery of why the curtains turned blue is now revealed, as they part and an image appears, the first being that of a rather exotic wedding couple. 19:01 I now give several examples with images of a variety of anxiety-laden life situations to which an aircraft may transport you, and thus an association can occur between the two. 19:45… after I use the Blind transition. Something interesting now occurs. I read the email as it’s written to the audience, having obscured the author’s email address and name. So far, so good. But when it came to placing it on YouTube, I had second thoughts and wanted to obscure identifying details of the email, without losing the gist of it. So I re-recorded my reading of the email, and altered the email itself by changing locations and certain events to further protect the writer’s identity. 19:59 You can hear the change of sound quality at this point as I read the email, then cut back again to the live audio. 21:00 Nothing more needs to be added to the email, and I wanted now to offer an even more engaging illustration of a fearful flyer, and so used a brief section of a video called “This Emotional Life” from the PBS network, which I actually use with my patients. 22:10 I used this clip to try and help the audience move away from their possible preconceived notion that fear of flying is all about planes crashing, when for the vast majority that’s not where the action is. 22:52 I now want to focus on concepts of fear and differentiate it from anxiety, and move into some of the biological aspects of the subject, which I believed might be a bit of a stretch for my audience. Thus it required something of a “setup”, as a comedian might describe a joke, to prepare the audience for the more challenging concepts to come. 22:51 The setup here is to explore a commonly used, but false acronym, using the letters, F.E.A.R. I use a recent TV show to further illustrate my point of how frequently this concept is used. This appeals to the concept of authenticity, where I show evidence for my assertions. 23:01 This very short sequence is from the recent TV series, Necessary Roughness, featuring the work of a fictional performance psychologist. 23:41 … and further use the anagram to play on the words again, to go from what if to what now, so as to more fully appreciate the nature of anxiety. 23:51 This is a Quicktime movie from a History Channel documentary of 2008 called The Brain, and at various points I cause it to loop while I explain various important concepts, the most important being the brain has older and new components due to our evolution. Sometimes those older components overwhelm the new parts where language and decision-making reside, and so rational thought can fly out the window under certain conditions, with very old routines, like flight, freeze and fight taking precedence. 24:38 Because so much action is taking place on the big screen and complicated concepts are on show, I break my usual rule of not looking at the screen to explain what’s happening. 25:10 Having spent a few moments engaged in some of the science of anxiety, it’s time to turn these ideas into treatment strategies, and so we return to the book I referred to earlier, and extract the treatment gold standards. 25:19 I break lots of rules here by putting up lots of words and ideas. I don’t like doing this in front of a live audience, then rushing through them. Not a good idea. But I also knew the presentation in some format was to be placed on the APEX members’ website for later viewing, and so I wanted these ideas to be seen in their entirety. In this case, my intended audience was not the live one in front of me, but the unknown APEX members who might refer to this presentation over the next few months, or even years. 26:19 After going through the points very quickly, it’s time to get to the meat and potatoes section of the presentation: Why Aviation needs to better understand fear of flying and learn what to do about it, in order to improve its bottom line. Rather than hit the audience over the head with this idea (some presenters might be bolder and do just that, but by now you’ll see I prefer a more subtle approach in my persuasive story telling), I bring the audience’s attention to New Challenges. 26:38 I look down at the Mac and note I have about 7 minutes to go and I have prepared a funny segment from comedian Louis C.K. about the perils of modern flying which is 5 minutes long. For a moment, I contemplate skipping it entirely, and so finish early, but then the thought hits me that the video is so much fun it would be a great way to go out on. In hindsight, it might have been better to put this video in much earlier, perhaps a few slides after the section on 9/11 and PAN AM to highlight how much of the fun of flying has left us, which this vignette captures brilliantly. As it is, the video is heavily edited, and I’ll show you when and how in the next section. I probably could have edited it even further and reduced it to 3.5 minutes, perhaps next time. Note too how I forewarn the audience they may become anxious watching the video, which no doubt piques their interest and keeps them watching to learn why. 28:42 Notice how I embed the Quicktime movie of Louis C.K. (it’s episode 5) in a TV set (complete with original AppleTV) to let the audience know they’re watching a TV show. 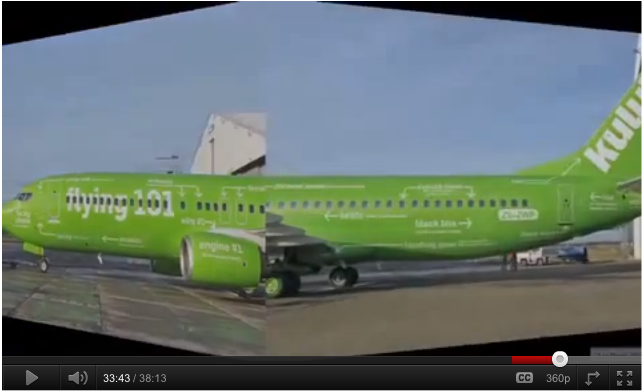 It also lets me keep the video small, as any bigger it would poorly display with lots of pixelation. Note too that as the movie progresses, there is an audible echo. This is because I wanted to keep the live audience reactions along with the embedded sound in the movie, but as it went along the synchronisation badly fell over. With my haste to get it up on YouTube, I let this go, but in the future it would require a different approach to maintain synchrony. 27:38 Look closely here and you’ll see an edit. This is because Louis C.K. asks why his just purchased flight was cancelled. In actuality., the checkin crewmember tells him the plane which was doing that flight has crashed with no survivors other than a small baby. I thought it best not to include this in a presentation to aviation personnel. Bad taste. 28:28 This next sequence where the TSA officials question Louis about his carryon “lube” is one of the funniest yet unpredictable parts of the vignette. It’s a high risk segment as not everyone is comfortable with public discussion of sexual material, especially in relation to masturbation. It’s also high risk because of cultural prohibitions that might have been in place with an international audience who could easily be offended and complain to APEX. So far, I’ve not received any nasty feedback. 30:55 At this point, I’m looking at the audience as I do usually when I play movies, gauging their reaction, having seen the video many times by now. I notice the APEX committee member who introduced me gesticulating to her committee chairman to get his head out of the papers in front of him, and look at the video. It turns out he is as big as Louis’ seat companion, and she wants to mess with him at little! 3. and the one you wished you’d given. It’s at (3) when you debrief yourself that you become your own harshest critic and honestly assess what you could have done better or differently, and actually make changes to your presentation to reflect these considerations. 32:43 We’re coming to the end of the talk and there are some final acts of persuasion to perform. So we turn a new leaf, so to speak with the flop transition to reveal New Challenges. 32:48 A little surprise here as a I refer to challenges like dress codes using the drift build which bring an image in offscreen, pauses it for a moment mid-screen, then screeches off the slide to the right. Blink, and you might miss it. Dropping in little surprises like this helps the engagement, as long as it’s relevant and not overdone or in poor taste. This one got a good laugh, fortunately. 32:58 I refer to New Challenges as in fact New Opportunities and use the Anagram build to make the transition. 33:04 At this point I could probably truly finish and bring the show home. But the audience is enjoying themselves and I will be only two minutes overtime. What you don’t see and hear because I edited it out is my asking the next presenter if I can have two more minutes, which is really his time. This is really stretching a friendship, and he would have every right to say no. But he enjoyed the presentation too, and so allowed me to continue. If my presentation had been dull and boring, he or the moderator would likely have pulled the plug. So I show a few slides from a colleague, noting they’re not my slides obviously (a little naughty of me) which show airlines and their sponsorship of fear of flying courses. This is setting up for a new venture I’m involved in which I will soon mention to wrap things up, without appearing too commercial. 33:14 I turn my attention to low cost airlines who are not interested in fear of flying courses as they offer no immediate return on investment, especially given the trend now to “nickel and dime” passengers by charging for every little aspect of flying, from luggage to seat choice to priority boarding, etc. 33:18 This Mosaic transition took quite some time to develop, as I was trying to work out just how Keynote laid out the rotating squares, and then place a picture of a low-cost airline right on the square. In order to do so, I first laid out a grid of yellow horizontal and vertical lines to see the dimensions of the revolving elements, and used Screenflow to take a screen movie which I could slow down and measure. I think you’ll agree it’s quite an effective transition which lasts only a few seconds, whereas to set it up probably took the best part of an hour. But the thing is, with a lot of the effects I create, the first time is always the most laborious, then one can use it as a template for future presentations, simply substituting different images relevant to the next presentation. 33:27 ..while I say the words, I bring them from the rear aircraft to the fuselage of the front one to drive the point home. Perhaps an unnecessary effect, but again a little surprise to keep the audience engaged as the presentation draws to a close. 33:46 Using MagicMove once more, I focus in on the “mile high club initiation chamber” – the loo – which brings a laugh. 33:57 As I wrap up, I want to remind the audience that fearful flyers don’t like too much choice as it can cause paralysis by analysis and so I quickly show a screencast of me booking a flight for a patient, and how the budget airline keeps throwing up hurdles I must leap over just to get the booking done, from offers of accommodation and car hire, to carbon offsetting, through to priority boarding etc. 34:33 I now want to remind the audience that we are together in the customer focus business and so I need a model to emphasise this. Who better to model how to delight customers than Steve Jobs, who, alive at the time, had authorised this forthcoming book (due next week) to be published. Once more, I created this from a flat picture into a 3D hardcover using Boxshot3D. 34:41 MagicMove shifts to the book to the left, creating some “white space” which the audience has come to expect will be filled with something interesting, and I bring in two descriptions used for how Jobs thought about the customer experience. 34:58 I prepare this advice for cabin crew and airline staff not knowing who my exact audience would be, but in the knowledge the presentation would likely be seen on the web by those for whom the guidance on this slide would be appropriate. By offering guidance, it also gives people a take-home set of messages, and hopefully adds to their estimation of me as a “go to” authority on the subject. 36:00 I now show my tech knowledge by referring to a budget airline’s project using the iPad where fear of flying information could be included. The crew who let the cat of the bag was not Jetstar itself but the content developers. 37:09 Here I finish the talk by showing some slides from a colleague, a Qantas captain with whom I am preparing a fearful flyers’ course using a professional flight deck simulator. He was supposed to have been part of the presentation but became ill at the last moment, and stayed in Australia. As it is, it would have been a major presentation rewrite to include all of his slides had he been with me at APEX. 37:23 The money shot slide which shows the program we’re likely to run in 2012. 37:35 I felt the real urge to finish since I was so overtime, so rather than summarise the main points, I simply thanked the audience and let my first slide with my personal details confirm the presentation is over. Next time, I would take 30 seconds to make three brief summary points, including a “call to action”. 37:40 The moderator makes mention of my missing “co-pilot” since he’s listed in the APEX program and some might have come along fully expecting to hear from an airline captain. This was the first time I had performed this presentation and while I was hoping I could bring it in on time, lack of rehearsal (I had been waiting all morning for the colleague’s slides to arrive by email) meant I was a little off. Should I do this again for another agency or group, it would be right on 30 minutes if that was my brief, or could easily be extended to 45 minutes if allowed. There would be a challenge to reduce it to the standard conference time of 20 minutes but there are plentiful slides that could be dropped and the show tightened to meet that criterion. So, I hope it was worth it for you to read this long blog entry and see how I think about my presentations, from conceptualisation, to slide construction through to the live show. In Presentation Magic workshops, I go through slide construction in detail, dropping out of the presentation and showing how I work with Keynote to achieve these effects. I don’t do this with Powerpoint as it doesn’t lend itself easily to my workflow or creativity, but I ‘d suggest in the hands of a competent user, 95% of what I showed can be achieved in Powerpoint, and perhaps a few extra things to boot. Certainly, having a linear editor like ScreenFlow 3 was extremely helpful in producing the final product you see on YouTube, and I can only hope that when the next Keynote is released, perhaps as Keynote Pro X, it will get a rewrite to make presenters’ jobs that much easier yet get the creative juices flowing too. Please join in the discussion with your comments or questions, below. Good pickup! I actually use it at the beginning too. It’s one of screenflow 3’s built in transitions. It’s quite a versatile application, worth checking out. Believe me when I write and say it’s not my modus operandi. I can’t stand it myself and in workshops get people to move away from it. In this case, I knew the video was to be put on a website where airline officials could view it at their leisure, and so I put them all up in one slide, rather than split them over several which would give it a “rushed” feel. I really laboured over this and your criticism is fully justified. It might have been better just to focus on two or three of them, and simply refer to there being others which I could forward to people via an email or in person meeting. Good pick up! Les, nevertheless, great presentation! I wish Apple would update Keynote to 2011 so we could have a timeline. 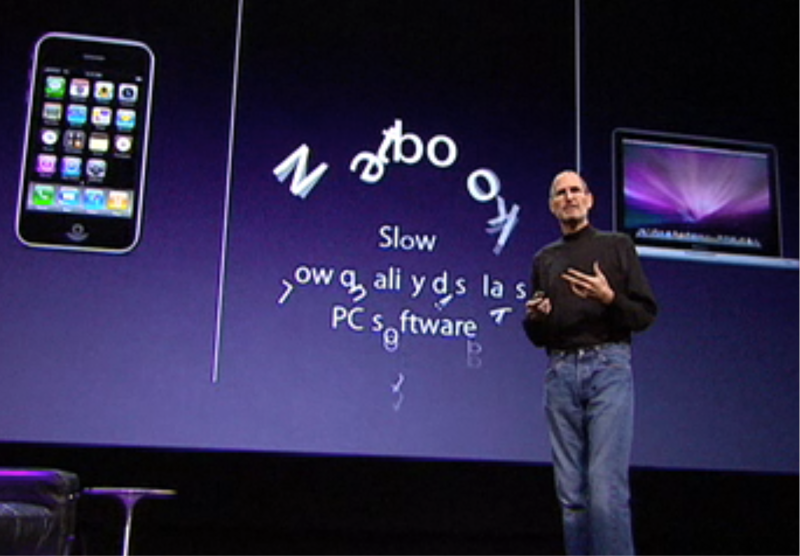 Now that Steve is no longer with us I wonder what attention Keynote will now receive. I also use ScreenFlow, which is a great program. It’s a good question I’ve pondered too, and not just about Keynote. It’s likely Steve approved a roadmap for Apple’s future products four years into the future, at the least. So his hand will still be present in the next update of Keynote. Given its long gestation and how PowerPoint has played copycat in its latest version, I’m guessing to prepare for Keynote Pro X, a major rewrite a la Final Cut Pro X. Lots of gnashing of teeth and tut-tutting about Apple’s choices, but ultimately a huge improvement. Fingers crossed. Les thanks for a very detailed tutorial on using Keynote to develop a spellbinding, attention riveting, and educational presentation!! !